Israel's second game in the 2008 European Championship Qualifiers won't be remembered by Israel's four goals, and also not by the first goals scored by Amit Ben Shushan and Toto Tamuz. 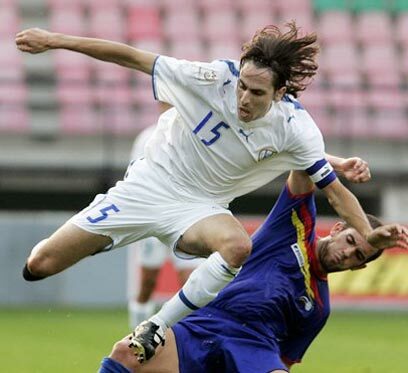 The easy 4:1 win over the Andorra underdogs in the "home" game will be associated with one thing – the ugly statements made by Andorra coach, David Rodrigo, at the star of the team Yossi Benayoun. Benayoun said after the game that Rodrigo shouted at him: "You are a country of murderers. We'll break your legs." Shaul Eisenberg, the team's press correspondent, said in response: "The team won't put this on its agenda. We will complain to UEFA." After the incident, Bosnian referee Siniša Zrnić handed out a yellow card to Benayoun of all people, who was seen arguing with Rodrigo. Rodrigo denied Benayoun's accusations in a conversation with Ynet. "Benayoun laughed at us when we were down 0:2 and that's why he got a yellow card," said the Andorran coach. "The fourth ref said this to the head ref. I never said any sentence like this to him. And what we said between us is nothing important, it was football talk." On the incident between Benayoun and Rodrigo, Omri Afek said, "I passed by and I heard with my own ears the nasty statements made by the Andorran coach. I think the ref should have thrown out their bench, and not give a yellow card to Yossi. That wasn't appropriate." Afek added: "We did our part. I'm glad we completely dominated the game, making it an easy game. The goal scored on us was unnecessary. You can count on one hand the number of times Andorra made it past the half line." See all talkbacks "Andorra coach: Israel country of murderers"